Mason Graphite (“Mason Graphite” or the “Company”) (TSX VENTURE:LLG)(OTCQX:MGPHF) is pleased to report that NanoXplore Inc. (“NanoXplore”) is now a public company and its shares began trading on the TSX Venture on September 8th, 2017 under the symbol “GRA”. NanoXplore became a public company following a Reverse Take-Over (“RTO”) transaction with Graniz Mondal Inc. and the concurrent closing of a $9,697,082 equity financing with various institutions, which was done at a price per share of $0.45, giving NanoXplore an initial market capitalization of $36,332,260. 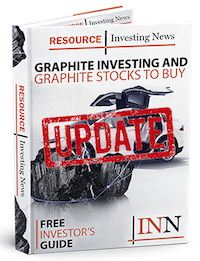 Following this financing, Mason Graphite’s ownership stands at 25% of NanoXplore. Management of Mason Graphite sees definite potential for growth in NanoXplore and a lot of synergies in the partnership in place. Mason Graphite is the sole supplier of graphite to NanoXplore and is also a sales, marketing and distribution agent. Furthermore, both companies are working closely together based on a Laboratory Service Agreement and an exclusive License Agreement for certain processes which were established in 2015.